EDITED: This was just an April Fool’s Joke. Ready for a fresh new idea? Somethings really fun, vibrant, and inviting for Easter? Check out my new new Easter Pots. The perfect and easy addition to your Easter cooking. 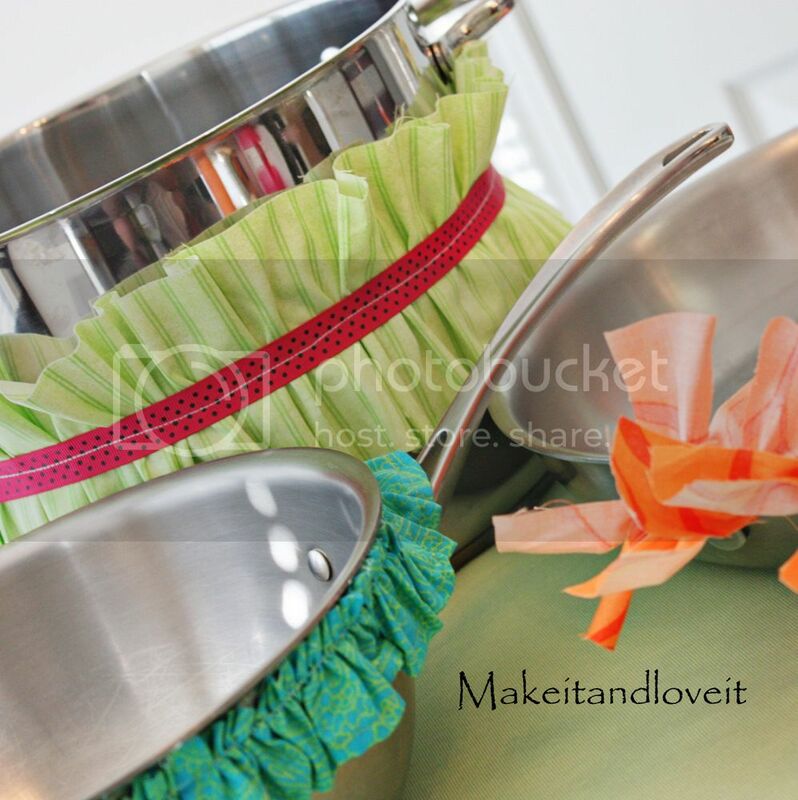 Ruffles, color, and flair……what could be better? Get your hot glue gun out and attach the frill. And how pretty they’ll look on the stove, cooking the perfect Easter dinner…. And don’t worry about placing your food in serving dishes, just transfer your food from the stove, right over to the table. So convenient and darling! Did you notice that March has ended, and today is a new month? Hahaha……You gotta love the fire hazard up above, right? I can only imagine that fabric getting caught on fire and ruining your whole Easter dinner. Blech! Did you catch my April Fool's trick yesterday? I just subscribed to your site this morning and this post made me a little leary…until I scrolled. I have a great appreciation for good humor!! Thanks for the giggle! PS – I'm loving your blog and your etsy shop! Very inspiring. I was thinking "Wonderful idea but maybe it is only for decoration, not for fire cooking." Good trick well done. I was just remembering your joke from last April Fool's this morning and this STILL got me! I was thinking that it might work if you put it on the table, but not on the stove! :) haha…you got me again! You got me! I was totally thinking…"um, i'm not sure I would hot glue that to my pots". Or "isn't that a fire hazard?". 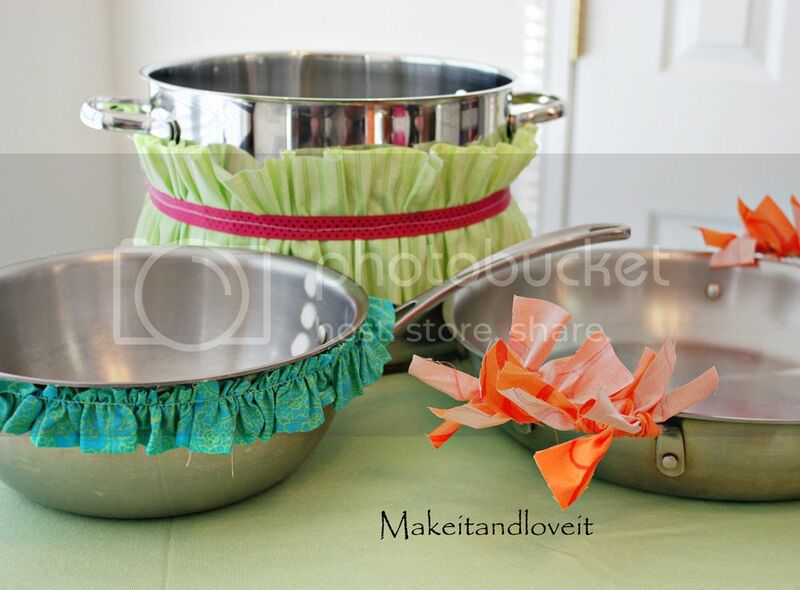 Great April Fools…but, i have to admit, i do think the pots are cute and springy…i really like the big ruffle! Just do it with elastic and add it to a bowl for a fun party. As I was reading this I was thinking "this girl has lost her mind!" Too funny! Very funny! I was thinking you had fallen off your rocker there for a minute. You got me.. Happy April Fool's! lol I wa thinking you were using them as decorations on the table. Thanks for the early morning laugh. I actually thought you were suggesting the easter pots in place of baskets…which is really a good idea too…then you don't have to find another place for baskets. So glad that this was an April Fool's Day joke. I was wondering why on earth anyone would go to all the trouble to dress up their cookware! I thought you'd lost it for a minute! Very funny post. You got me. I was pretty appalled by the "get your glue gun" concept. Ack! The ruffles are pretty and all- but regardless of the fire hazard, the permanent-pot-decor idea was a little much for me. :) Good one. Happy April Fool's! I thought you'd clearly lost your mind! I'm going to link to this best April Fools idea. HAHAHA. I had one eyebrow raised durring this post. You're so funny. Plus the idea of reheated hot glue running down the pan while you boiled noodles. AAA. Kill me now. Thank you for letting this be a joke! I was thinking you may have lost your everlovin' mind! Too much craft glue! So glad that was a joke! haha You got me good. I was thinking "man, she really is stretching for ideas now, isn't she." Good one! You totally got me! For a moment I though you had lost it :) Loved it! OMG I am so glad you were kidding about this. I was like "Man I usually love all her ideas, but this is a little whacky…." yup. you got me. I would never have done such a thing, but I thought YOU were serious about it. I'm so glad I didn't have to post on my blog that Make It and Love It went crazy. ;o) haha. Thanks for the good joke. You totally got me too! I was really surprised at how excited you were about an obviously terrible idea. I kept thinking about splattering grease getting all over those ruffles, and all kinds of fires from the gas stove. Very funny! :) Thanks for the laugh. Ha ha ha!! Good one; I love it!! OH! OH!! OH!!! I have been a lurker for ages, but finally just made myself OFFICIAL — as your 6,000TH FOLLOWER!! You are amazing! 6,000!?! Does it ever make your head SPIN?? You got me! I thought you were starting to lose your edge Ashley. Glad to know you're still with it! As I was reading this, my eyes got big and I'm pretty sure I said WOW! out loud! I was thinking to myself "She usually has really great projects, but wow, not today!" Ha ha! Good joke! You got me! I thought maybe you'd lost it. LOL! Glad to know it was just an April Fool's joke! lolol. I was reading that and thinking, "Omg, that's going to catch on fire!" lololol. Totally got me!! Serves me right for not reading the whole post the first time!!!!! GREAT april fools!! Thanks for a good laugh! I decided to ignore the fact that you'd said to use them as stove pots and thought how nice it would look if it was threaded with elastic and went around a serving bowl. Obviously I'm not Ms. Safety Queen when my main thought was "Well, to each her own." this was hysterical! Thanks for the giggle (And i totally fell for it, I was ready to tell you that you were nuts!) Happy April! Yeah, you had me. I was thinking "hmph…I usually like her taste so much…but that?? hm…"
I have to admit I had a sigh of relief when I saw it was an April Fools joke! OH yeah, you got me! I have been on alert all day for April Fools jokes, but this one completely got me! You got me! I actually just looked through a random catalog and they had washer and dryer covers/cozies with ruffles. Totally reminded me this! Unfortunately, the catalog was not a joke! Ahahahahaha, you had me!! I was think, "WHAT?! Is she crazy?!?!" LOL, good one! Glad there isn't an actual tutorial for that, it would be sad, lol. Wow those are super ugly. Totally out of taste for you, you had me for a minute!!! LOL. I have loved all of your ideas…until this one. I thought, "Wow, she must be running low on new stuff." I wasn't diggin' it. Thanks for the laugh! LoL! As I read, I was trying to think of a polite way to comment on this post without being dishonest! Oh, good. I was going to keep my rude comment to myself about how weird that idea is. I'm glad it wasn't real! You're so funny. I was going, "you've got to be kiding me!" 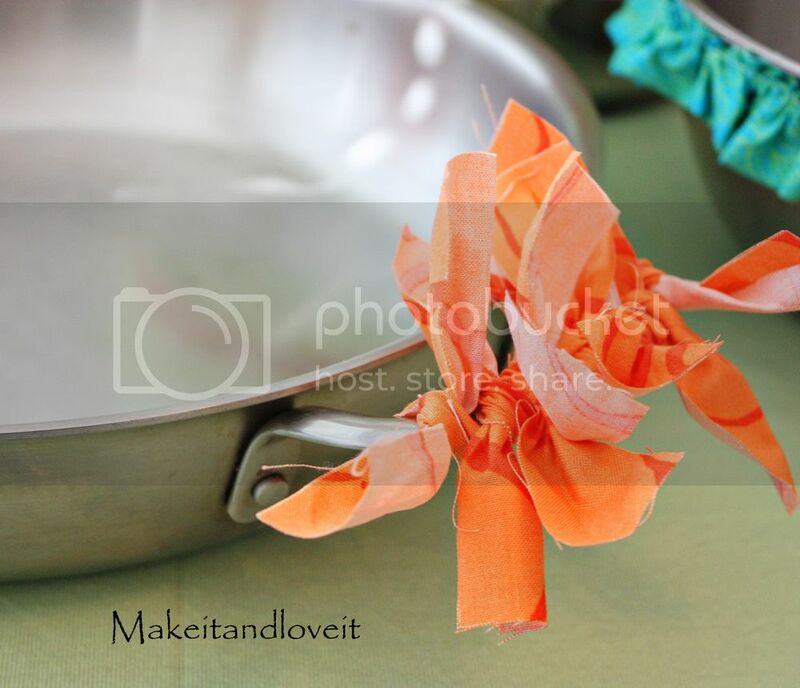 Modge Podging shoes is one thing and very classic Ashley, but hotgluing FABRIC to cooking pots….you are hilarious! I have sat here and laughed and laughed at your comments. Perhaps i should do a May Fool's day and a June one too!!! That was so worth it…..and I love that some of you thought I was off my rocker, that the glue was getting to my brain, and that I had finally run out of ideas. Actually maybe there is some truth to those things, but hey, I'm still having fun!! :) Thanks for all being good sports! This was the only thing that "got me" today. I was all worried that you had jumped the shark and I would have to remove your site from my list…well done! Good one! You nailed what I was thinking…a little TOO crafty and umm fire? :o)They are cute though. Just when I was getting sick of the increasingly awful burlap wreaths I've been seeing all over the blog world lately, I found something new to test my disgust – your needless and stoopid decorations for Easter pots. Imagine my relief to learn it is a goof! Whew! Ya got me! Big time. so…. I really thought…. Ashley, way to much time on your hands if you decide to hot glue things to your pots! haha! great one! As I read this yesterday my head kind of tilted to one side and I was squinting my eyes and kind of saying, "hmm?" 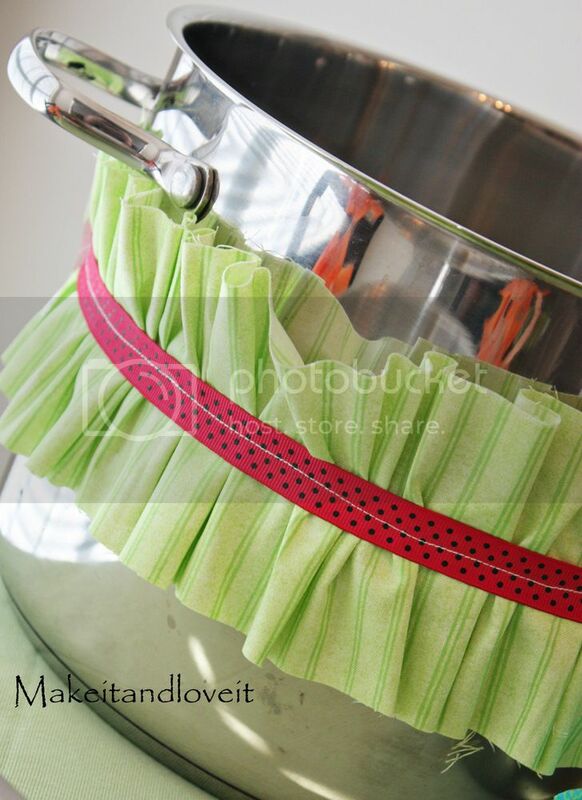 The ruffles are darling, but maybe better on a little girl's dress than, say, on my gas stove. :) Hilarious!! I love that you tricked so many of us, good job! I'm having a giveaway on my blog for some yogurt and a spa-at-home set. Come check it out. You got Me! That was a good! 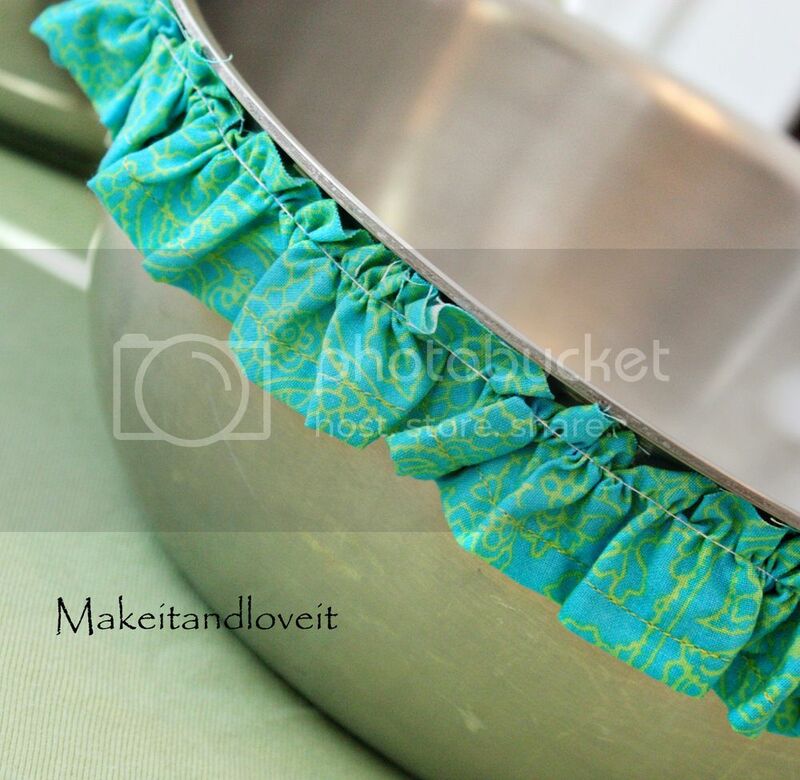 I also didn't bother reading the tutorial at the end…for some reason hot gluing ruffles to my pans just wasn't very attractive :) I thought you were serious until today, haha!! I so posted that as an Easter idea on my blog yesterday!!!! HAHAHAHAHA! That was a good one! My thoughts were "How in the heck do you wash it with the fabric there?" And "what if its Christmas time and I really DONT WANT spring colors on my pots??? Then what?" Great Joke! You got me too! oh my…i was dying. I was like seriously….then i saw the april fools one! so funny! you're great! love your blog! I blog stalk your site. I saw this and thought…um that is weird but I trust you and you ideas are so cute and I started to convience myself I could do something like that for my serving bowls…then I realized it was a joke!! lol LOVE IT!! lol. i was just thinking.. if i hot glue it then i couldnt take it off when i go to wash the pot. i didnt think of it being a fire hazzard! lol. good one. I guess I'm the one that's going off the deep end because as I was reading and looking at the pictures I kept thinking how cute they were and that I would love to decorate my pots!! Then after reading all the coments I realized that I must be super sleep deprived (I have a 3 month old and 2 year old that no longer wants to sleep thru the night because of the baby) because the fire hazard and dripping hot glue didn't even dawn on me! !